Come on, make your secret dream come true, be like Harry Potter flying the broomstick, and be a real witch on broom this Halloween! Halloween is coming soon and we all shall be prepared to enjoy its spirit, being happy creepy, spooky for a while unleashing our weird fantasies about this special celebration, on 31st of October. Take your family and friends, and especially the kids for trick or treating and see how excited they get! Halloween is the most expected fun celebration of the year! So what about a "Witch broom Halloween spirit"!? Halloween witch's broom and broomstick, and let's go, flying the broom! Your own home-made crafted Halloween witch broom! broomstick", and I'll do my best to create perfect atmosphere inside and outside my haunted house, on the roof of the house, at the front door porch, back yard... everywhere! Halloween accessories like: witches, witch hats, black cats, bats, dark birds, spiders and other terrifying insects, zombies, spiders net, zombies, skeletons, brooms and broomsticks, Halloween lights, pumpkins, Halloween broom sticks, vampires, ghosts, ghoulies, monsters, devils, masks, all the creepiest "goodies" for Halloween! 31 October - Halloween celebration - is the perfect time to impress your family, friends and all the neighbors! This time of the year all supermarkets are full of special design decorations for Halloween and you can find all kind of scary Halloween decorating ideas and items. But the coolest thing is to give a try and craft yourself a spooky Halloween witch's broom! 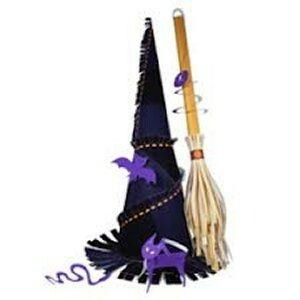 And even a special Halloween witch broom with treats! And everybody will be thrilled about! Don't hesitate! To craft your own Halloween witch broom, or even make a bootiful vintage witch broom, does not require a skilled hand, just take a look at all the gorgeous terrifying stuff from the market, watch Harry Potter, cartoons with famous witches, browse internet and magazines for Halloween Witch Broom Decorating Ideas, take a look at all photos enclosed in this lens, buy need materials, then unleash your imagination, be creative and experience decorating Halloween brooms and craft your first Halloween broom! Now you're ready to become "the witch on broom in front of the moon" for a night! 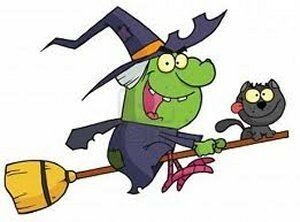 Be the Halloween witch flying the broom!